That's such a nice narration, Susan. I still haven't decided what to do, and there seems to be so little time! Ah, you should be given an award for that beautiful naration - weaving a movie with a recipe!! :) The pie looks delicious! Great synopsis on Mildred Pierce, made me want to go right out and rent the film! I've really started to enjoy old B&W films recently and it's nice to know which ones are worth watching. OMG. That pie looks amazing and it is prefect timing for your post since I was just thinking of getting peaches at this weekends farmers market! Thank you, thank you! very lovely looking pics. The pie crumble looks so tempting. beautiful entry. 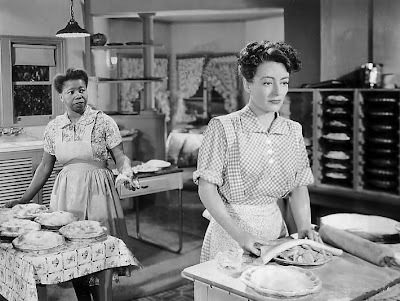 Haven't watched Mildred Pierce for many years -- haven't made a peach pie ever! Your post makes me want to do both. 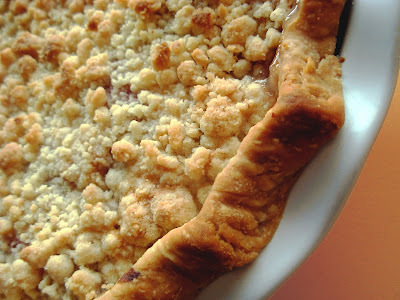 Terrific post and gorgeous pie! I really should get cracking for this blog event.... My creativity seems to have dried out this few weeks. And peaches are perfect right now! I can't tell you how many times I saw that movie on late night tv! Think I should get it again now! Wonderful write up on it. You know, I think Joan Crawford may just be my favourite actor. The perfect visage for black and white - love that film still. Fabulous choice of film Susan, one I'd not heard of before today. Your own pie making skills would be more than enough to fall back on should you ever hit such times I dare say! 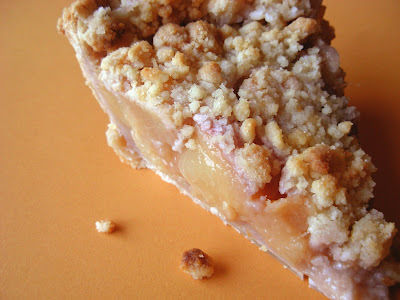 And as for that juicy peach at the top...suffice to say that I want this pie in my oven right now too. I am clapping and whistling here. Well, not whistling too loud as I can't whistle that well :) I so want to see that movie Susan. The peach tart, I would love to have a slice. Great job. I've read about Joan Crawford and know that she was a magnificent actress, but I have never watched a movie with her, Susan. This sounds so interesting! Love the pie, too - you are a terrific baker. Susan, lovie - Great, concise description of the film's major plotlines. Mildred, like Leslie in The Letter, is a very complex character; one feels both supportive of and manipulated by her. This is one film where I didn't mind the Hays Code influence, for that Veda really needed to be dealt with, though I would have preferred Mildred shoot her, but then we wouldn't have a noir heroine, would we? I love that you use so little filler in your pie, making yours substantially peachy. I, of course, love the addition of ground ginger, which I hadn't read before as an ingredient for peach pie filling. It must have been gloriously aromatic in your kitchen during the baking process! What a great event you are hosting. I can't wait to see the round-up. Thanks, Sra. I’m not so strict that the deadline must be August 22. I’ll be doing the round-up week of August 27, so if you can make it, that’ll give you a little more time before I post the round-up. Jyothsna – You are very sweet, as sweet as the pie. Thanks so much. Hi, Mari. There are tons of high quality, classic B/W films available on dvd now, from several different countries. Mildred Pierce is a fun flick for a hard-boiled story. Most film noir have much tougher story lines. Shn – So now you know what happens to Mildred. : 0 Hope you can join in the event. 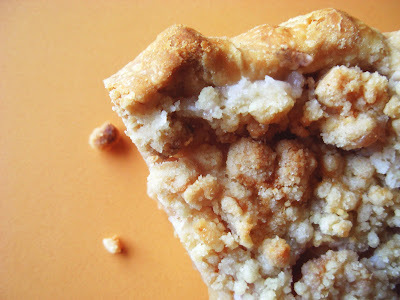 I love crumb topping and prefer it over the traditional top crust. 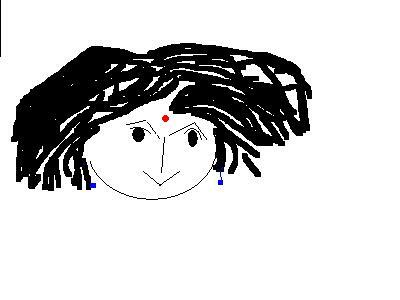 Thank you very much, Sharmi. Pie crumble is so easy; one less pie crust to roll out. You can also add some additional spices to it. Lydia – I know you don’t bake often, but maybe your husband will take advantage of the fresh peach bounty of the season. Thanks, Nora! Don’t pressure yourself. Sometimes if you just chill, an idea will pop up when you least expect it. Hi, Tanna. Mildred Pierce never fails to entertain me, no matter how often I see it (film buff that I am). I’m glad you enjoyed the write-up. Thanks! Lucy, thank you! – Crawford is classic Hollywood; she was definitely one of the silver screen’s top golden girls. I have a great book, “They Had Faces Then.” They weren’t kidding. The top photo is of a white peach; I love its pale fragility, and generally prefer the whites for baking and eating out of hand. They have a perfume and flavor that are really supreme. And where would the Bellini be without the white peach? Cynthia, this is a great “chick flick.” Mildred goes through the wringer, but she’s a survivor all the way. Thanks for the kudos! Welcome, Maryann! Thanks! Good to see you. Thanks, Patricia. Crawford could ham it up and chew the scenery sometimes, but this story really highlighted her acting skills. There are some scenes, that I couldn’t get into due to time, that are priceless. Thanks, dear Shaun – Mildred sure was complicated and manipulative, but didn’t have the ice-blooded, steely fury of Leslie Crosbie. I never felt any sympathy for Leslie as a victim, not even when she walks out to the garden in that knock-out final scene. I felt sorry for her husband, lawyer and the wife of her dead lover. Leslie had to die and she wanted to die. Mildred couldn’t shoot Veda; she wasn’t that kind of mother, not like that dame in The Grifters. I knew you’d love the ginger with the peaches. Cinnamon and nutmeg might have overwhelmed the fruit's delicacy. I want to see that movie. :) and than I will try this pie. After all you can see them on my Turkish cooking blog. :) I will link at you ofcourse. loved reading this.. and that is a perfect slice of pie. Thanks, David. Good to see you. Hi, Ayse! Thanks so much. I'm glad you enjoyed it. I don't even want to see the movie anymore.. Wow! You have thang ;) going on gal! i could literally see the movie....you have weaved it beautifully.....your pie looks gorgeous too! 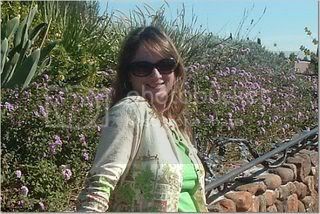 Very nice post, Susan: it is a pleasure to read (all your posts are). Suganya - Thanks for the supreme compliment! Thank you very much, Nanditha. By the way, I will be posting the Page 123 meme this week. I hope you enjoy it. Hi, Simona. It's very gratifying that my posts give others pleasure. It makes all the work worth it. It's very dear of you to say so. Thank you. Thanks, Padma - Glad you like it. You don't have to limit yourself to peach; any fruit will work well with this recipe if you have a different favorite. Welcome, Rahin! Thank you for your kind words. Whatever you choose to make first will depend on your mood - sweet or savory! Oh man that looks good. Peaches are my absolute favorite fruit - I think they're just perfect! I'm so behind on posts after going on vacation ... everybody has been so busy! Thanks, Abby. Peaches are probably my favorite, too - 'tis the season! I LOVE white peaches! What a great addition to a lovely looking pie! This looks so delicious that I have to try it! In my favorites this will go! Welcome, Bobby! Thank you! When you go through the trouble of home-baked crust, it is as good as the topping. Good to see you! Me, too, Sweet and Saucy. They really are special! Thanks! Hi, HoneyB! 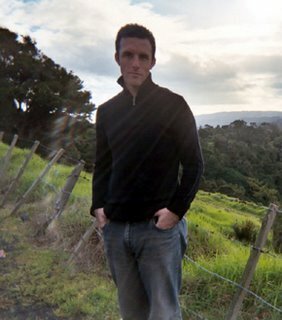 Welcome and thanks! Hope you do try it. I think you will be pleased. 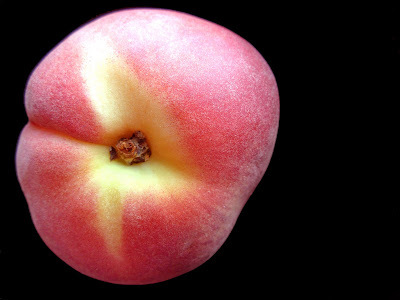 White peaches,the Saturn variety, are fairly easy to find in the supermarket. That peach pie looks so good!